Note: Dubai/Oman price calculated by taking the average of Dubai and Oman spot prices. The most widely used benchmarks are associated with crude oil that has four common qualities: stable and ample production; a transparent, free-flowing market located in a geopolitically and financially stable region to encourage market interactions; adequate storage to encourage market development; and/or delivery points at locations suitable for trade with other market hubs, enabling arbitrage (profit opportunities) so that prices reflect global supply and demand. 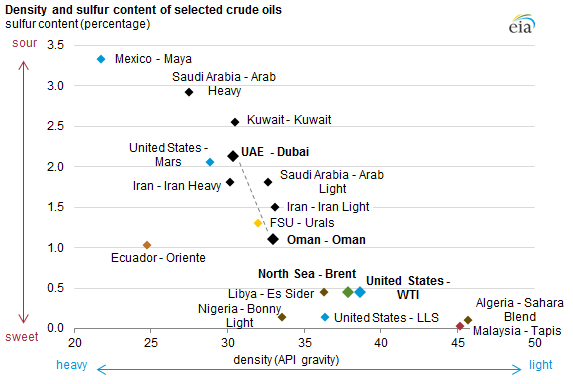 Other types of crude oil can be compared to these benchmarks by an agreed-upon differential. The agreed-upon differential takes into account a number of factors, including quality characteristics such as API gravity (density) or sulfur content, transportation costs from production areas to refineries, and regional and global supply and demand conditions, including refinery utilization. Three of the most significant benchmarks in global crude oil markets are Brent, West Texas Intermediate (WTI), and Dubai/Oman. Brent, which is the most widely used global crude oil benchmark, includes four separate light, sweet crude streams that are produced in the North Sea: Brent and Forties (produced offshore the United Kingdom) as well as Ekofisk and Oseberg (produced offshore Norway). In 2013, Brent crude oil loadings averaged 0.86 million barrels per day (bbl/d), representing about 1% of total world crude oil production of 76 million bbl/d. 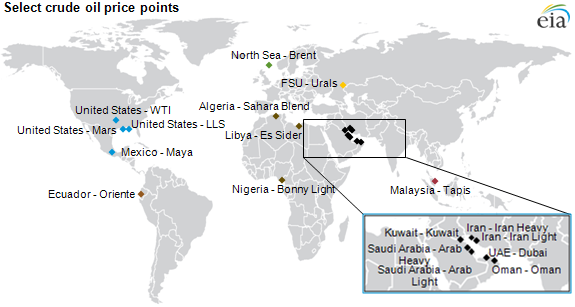 Brent is used to price light, sweet crude oil that is produced and traded not only in Europe, the Mediterranean, and Africa, but also in Australia and some countries in Asia. West Texas Intermediate (WTI) is a light, sweet crude oil produced in the United States that is priced at the crude oil trading hub of Cushing, Oklahoma. WTI is used as a benchmark for other types of crude oil produced in the United States, such as Mars, a medium, sour crude produced in the Gulf of Mexico, and Bakken, a light, sweet crude produced in North Dakota. WTI is also used as a benchmark for imported crude oil that is produced in Canada, Mexico, and South America. Dubai/Oman is a third major benchmark crude. The prices of Dubai and Oman crudes, both of which are medium and sour, are often averaged to create a benchmark that is typically used to price crude oil produced in the Middle East and exported to Asian markets. Dubai crude oil production has steadily declined for more than two decades, and in 2013 was only 34,000 bbl/d. As a result, Oman crude oil, which reached 0.94 million bbl/d of production in 2013, has been used to support the continued use of Dubai crude as a benchmark. Saudi Arabia's state-owned oil company, Saudi Aramco, uses the Dubai/Oman benchmark when determining the price of its crude oil sold for delivery to Asia. For more information, see the October 16 This Week in Petroleum.